These days such busy schedules and whole day occupied with my little baby girl, reading has taken a back burner, there are days I wish to read but never accomplish it. I’ve this fantasy of my reading place which is in the mid of mountains, lush green grasses, a pleasant weather along with my reading companion-beverages.Yes,while reading I get a craving in the middle of my read,feel thirsty while flipping through the pages of my book, I always keep my favourite drink alongside to sip on it. Avoiding snack time while reading because i feel so protective of my book the fear and the possibility of stains or smudges on the pages? So I skip munching on to something rather prefer sipping on a hot/cold beverage. I obviously have a set beverage for a particular meal time where in I get the maximum out of it and try not to get hungry or starve myself. 1.Hot Chocolate 🍫- With my mid-morning starting with a mug of hot-chocolate.What a relish it is😍.Hot chocolate actually increases the microcirculation in the skin, warming you and also the myriad of chemical compounds contained in chocolate trigger the brain to release endorphins that induce feelings of calmness. 2. Fruit smoothie: With no breaks for lunch I would dig into a powerpacked yoghurt fruit smoothie with chia seeds and nuts blended with fresh berries, I’ve always been a fruit person and what better way to indulge in fruits. Smoothies can make nutritious sense, packing satisfying ingredients along with fiber, vitamins, minerals and other health-protecting substances. 3.Green-tea– With my evening the dose of green tea which enhances mental alertness due to its caffeine content and help me focus more on reading and enjoy this time indulging in what I love and also lower my stress and rehydrate me. 4.Warm Milk– At night I end my day with a glass of warm milk which helps me relax and sleep better. Milk is considered as a wholesome food so it serves as my dinner option too. These are my drinks which I opt during reading,whether you make them or buy one, reading can be a celebration. Make a toast in honour of the teachers and your parents who took the time to teach you to read. They’re the reason you can enjoy new worlds and fantastical characters in the books you read. What are your favourite beverages/drinks to have while reading? Enjoy sipping and happy reading! This article is written as a part of #Thebookblogtrain conducted by Vidhya Thakkarand Siddhi Palande powered by Rupa Publishersand Tea Treasure should not be repurposed, republished or used otherwise. The content herein is owned by the blogger. Hosts are not responsible for any infringement caused. So, while we prepare for the fun festival here are a few ways to save the precious life giving wonder – water! 🌸Use natural colours, they wash off easily. 🌸Play in a separate area or the garden. 🌸Apply oil on your hair before stepping out to play, a single wash can be enough to make your hair colour-free. 🌸Wear old dark coloured clothes, so cleaning them does not need too much water and effort. 🌸Go for a bath only when you are done. Bathing again and again is sure water wastage. Hope these tips be helpful to you, though its a mere co-incidence that this year World Water Day and Holi are falling on the same day but even if it is a co-incidence, its time to remember that we as a planet are facing a global water shortage. While so many humans face this water shortage on a daily basis, we can try to ensure that our celebrations are not insensitive. Make this Holi even more special by saving every drop you can, for whom water is a luxury. Here’s wishing you a Super Happy Holi! This post is a part of the #HoliHoppers blog hop hosted by Mandavi , Dipika , Ruchie , Aesha and sponsored by VLCC Beauty Products & Phutawan Thailand. This International women’s Day i’m celebrating women and their most important role in the society- a home maker and a Mother🤗 Though being a home maker is not an easy task as considered it is,Although, ugh, that word,We need a new name for this most superheroic of responsibilities, which like all work done by superheroes tends to be carried out in secret, unacknowledged by government and society alike. How about homechief or CEO of the hearth? Sounds interesting! It’s time to stop apologising and feel proud of the great job you’re doing time has come for us to admit that feminists were wrong. There’s too much pressure on women to have it all. Something has to give it’s either our career, children, marriage or sanity, but something has to go on the back burner. Clearly, the word ‘housewife’ has a negative stigma attached to it. People seem to think stay-at-home women are slobs who spend the whole time slumped on the sofa, watching daytime TV, eating chocolates and wearing slouchy tracksuits and slippers,woohoo get your research done correctly, housewives and stay at home mothers are more to what you think😉 and there are pretty cool reasons of being a homemaker and a SAHM..
1.Take charge: Here,choosing to be at home one is not entitled to anyone,she is her own boss and that’s the best part you are not answerable to anyone. 2.No Deadlines: As you are your own boss you can do anything anytime(unless you have a mother-in-law 😜) and be privileged to enjoy your time and do things your way at your convenience and also prioritise things the way you want. 3.Enjoy Precious moments of your Child: Being a stay at home mom is so much fun where you get to see every first of your baby, be it first crawl,first step or the first time she sat on her own,life becomes more precious when u see your bub growing each day, it gives meaning to life❤. I believe one of the most important things you can do for your family is to create a beautiful environment for your children to grow up in, and for you and your partner to enjoy. Does this mean you have to mop floors and iron your husband’s shirts everyday? No. It means you need to create a home full of wonderful memories and family traditions. I plan my vacations anytime according to my convenience, unlike being in a full time job I need not apply for leave or count my no.of holidays taken.I can have a vacation any number of times in a year and make beautiful memories with my kids. 6.Work towards your Passion:Being a home-maker and a stay at home mom you can also get the privilege of working towards your Passion be it painting,designing , calligraphying or any skill and take it to another level and also earn through it at the convenience of your home. ▶I make sure I give my wardrobe regular updates. ▶Indulge with occasional beauty treatments. ▶Take regular exercise to keep my energy levels up. Dealing with motherhood for the first time can be a lonely experience, and after a while you become desperate to meet other mothers, I call them, who you’ll be able to depend on when you’re depressed, arguing with your husband, losing your patience, and about to snap. It’s so important to have a female support system, so make time to nurture your relationship with girl pals😀. It’s OK to admit that some days are an absolute nightmare. When you haven’t had a minute alone and your children are jumping off the walls, when your house is a mess and your husband isn’t around to help, or when you have a migraine and just want to curl up in bed. Days like this make you want to go for a drive and never come home. There’s no denying that, sometimes, life as a housewife really stinks and there’s no shame in feeling sorry for yourself. But you have to find a way to laugh it off. 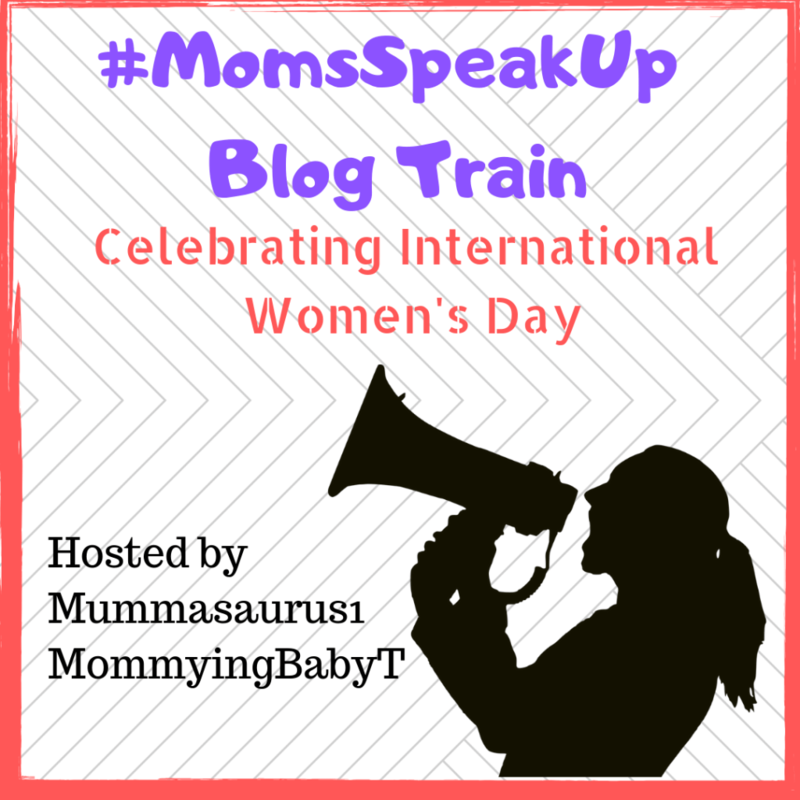 This post is a part of #MomsSpeakUp Blog Train by Nayantara of MommyingBabyT and Prisha of Mummasauras.com Do check their blog and post in this series. I would like to thank Romila Rawat Negifor introducing me. You can read her piece on https://www.google.com/url?q=http://Www.mamarfeels.wordpress.com&sa=D&ust=1551949665935000&usg=AFQjCNHcShvgyPnwDgKb2yg9ze1rpVyDZA . I would also like to introduce Ghunvathy Ghunjain of blog https://www.google.com/url?q=http://Ghunjain.wordpress.com&sa=D&ust=1551949665935000&usg=AFQjCNFM2XVYvbpw3zbpkvpp3NyfvXOC6g to this blog train. Do spend a few moments on her fascinating insights on parenting. It was not of the clues how d guitar played,not how d butterflies jumped inside d belly not how the sparks flew,love took time to happen.. It was just another casual day Wen Sassy’s dad returned home with a photograph n showed it to her “here’s d guy u gonna marry him my daughter” She an adamant crazy girl who wants everything her way said a straight NO, I’m in no mood to marry right now,if u compel me I’ll go with my friend somewhere without Ur notice n hide. Little did she knew the photo was of her dad’s friend’s son who had given him to send across for alliance purpose. N hey do u think it ended there…? After a year Wen her dad actually started searching a suitable match for her,he found no one as suitable to ve a meeting out of many boys who got rejected without even coming for d first interview or as u call meeting😛. The search was still on n one fine day wat happens is again her dad receives his friend’s son’s photo n asks her to ve a meeting with him just instantly, she was not ready to meet but her father insisted her to do so,she took d photo of the guy saw it thrice n was like how can u think I’ll meet this jerk, look at him he’s so bulky n d guy next door, atleast get me to meet someone really cool n classy but all her efforts in vain, her dad arranged a meeting n finally d day Wen Sober meets Sassy, sassy was peeping n seeing everything from d room she was like oh god, save me from this I don’t wanna do all this,Sassy’s dad called her out in d living area to meet d guests which she actually didn’t wanted to but had to. As she comes n meets and trying to go back someone whispers let them talk to each other for a while ,Sassy was all irritated but nothing can she show on her face she went inside d room along with Sober n started a casual chat, Sober asking her things abt her hobbies,college life n stuff she just answered n never questioned him back anyting wre in Sober said don’t u ve to ask me anything?? Sassy said No,I’ve nothing to ask, u speak I’ll listen, she was telling this out of no interest to speak but little did she know tat Sober fell in love Wen she said this, as previously wreever Sober went to meet a girl, there wld be firing of questions but here Sassy was d one who said u speak I’ll listen, tat took Sober’s heart away, he said an instant yes to her mother. After they left, Sassy put d damn Dupatta Down on d floor n says u guys happy u made me do wat u guys wanted, N d family members all laughing n asking questions how was d guy? Did u like him? Sassy thinking as if my No matters, she said he’s such an old School guy, looks like a typical Mumma’s boy, just does one thing office to home n home to office, not a traveller or an adventurer, more of a very religious guy he’ll just take me to religious places.. I’ll get sick with him he’s a total no no fo me,but to her surprise everyone in d family liked d guy n loved his nature, so it left no clue tat tey gonna say a yes n being dad’s friend’s son he had a brownie point too. A day later Sober’s mom rings up n says a yes from their side n asks for a second meeting somwre outside for Sober n Sassy but Sassy disagreed to tat again n said I cannot go with anyone on his bike if u really want me to go I wld go on my bike n let him drive his, but after her mum advised her she’ll accompany her to a mid-point, park her vehicle there, n go with him in his bike atleast to a few distance n finally they met had a small conversation Sassy again with no interest to speak ,sober after dropping her home asked for her phone no. n gave her his n fell in love with her again n happie for his new relationship. This is how d journey of Sober and Sassy started Sober all in love n Sassy d least interested one, even after her engagement until marriage she used to avoid him, give him less importance n hide her relationship from her friends too but now this 4 year of relationship Sassy learnt tat Sober is not d kind how she thought he was ,he’s a cool guy, a very jovial in nature cld make her laugh how much ever sad or angry she is,he is pretty adjusting n takes her on adventures too, surely for Sassy love took its time to happen n Wen it happened it was d best feeling to have.. Sassy n Sober’s love grew with d passing years with a blessing from above their lovely little daughter. This story is in response to How I met my soulmate n a photo prompt. This month February is all about love spending on luxuries all that you want to give your partner,the love of ur life but have u even thought there are people who are not able to get the basic necessities in life do you even realise they sleep empty stomach every night, I believe I as a community as a society could create an impact on these social issues, and one such I would like to address is poverty. The world’s poor are at disproportionate risk of torture, arrest, early death and domestic violence, but their civil and political rights are being airbrushed out of the picture. The Primary causes of poverty are unemployment, poor management of resources, under education, mental illness. ⚠The risk of Slum-dwellers, who make up a third of the world’s urban population, live in a poverty no better, if not worse, than rural people, who are the traditional focus of the poverty in the developing world. ⚠Many women become victims of trafficking, as a means of survival and economic desperation. ⚠Deterioration of living conditions can often compel children to abandon school to contribute to the family income, putting them at risk of being exploited. People in lower socio-economic classes are much more likely to get killed, tortured or experience an invasion of their privacy, and are far less likely to realize their right to vote, or otherwise participate in the political process. Hope this post would actually bring a change in the society n the way people look at the ones with less privileges n become more responsible towards helping out n reaching out the ones in need. 🌌Hola peeps how are you all? I’ve been busy with my baby Tas 1st bday preps and celebrations(full blog post will be up soon😊) Today’s blog post is abt Cleft in babies, before 3 years I’ve not known wat Cleft was until someone in my family got diagnosed of it, Are u aware wat cleft is? Cleft are openings or splits in the upper lip, the roof of the mouth (palate) or both. Cleft lip and cleft palate result when facial structures that are developing in an unborn baby don’t close completely. Cleft lip and cleft palate are among the most common birth defects. They most commonly occur as isolated birth defects but are also associated with many inherited genetic conditions or syndromes. Firstly we thought tat this will b cured naturally as the baby grows the tissues will form n things will b fine💮 but after doing a lot of research we got to kno tat it occurs one in 700 babies annually, and is the fourth most common birth defect in the U.S and More than 1 million cases per year in India n needs a medical attention and requires a medical diagnosis. 📌these are due to a combination of genetic and environmental factors. 📌Another cause may be related to a medication a mother may have taken during her pregnancy. Some drugs may cause cleft lip and cleft palate. Among them: anti-seizure/anticonvulsant drugs, acne drugs containing Accutane, and methotrexate, a drug commonly used for treating cancer, arthritis, and psoriasis. 📌And also due to d consumption of tobacco and Alcohol. Its DIAGNOSIS is done through a Prenatal ULTRASOUND in an unborn child. If the clefting has not been detected in an ultrasound prior to the baby’s birth, a physical exam of the mouth, nose, and palate confirms the presence of cleft lip or cleft palate after a child’s birth. EATING problems as food and liquids can pass from the mouth back through the nose, EAR👂 infections as they are more prone to fluid build-up in the middle ear. If left untreated, ear infections can cause hearing loss, SPEECH👄 problems as the voices don’t carry well, the voice may take on a nasal sound, and the speech may be difficult to understand, DENTAL Problems as number of cavities and often have missing, extra, malformed, or displaced teeth🕊. Having a baby born with a cleft can be upsetting, but cleft lip and cleft palate can be corrected. In most babies, a series of surgeries can restore normal function and achieve a more normal appearance with minimal scarring. A cleft lip may require one or two surgeries depending on the extent of the repair needed. Surgery to repair a cleft lip usually occurs in the first few months of life and is recommended within the first 12 months of life. Surgery to repair a cleft palate is recommended within the first 18 months of life or earlier if possible.Repair of a cleft palate often requires multiple surgeries over the course of 18 years. The initial surgery creates a functional palate, reduces the chances that fluid will develop in the middle ears, and aids in the proper development of the teeth and facial bones. Many children will need additional surgical procedures as they get older. Surgical repair can improve the look and appearance of a child’s face and might also improve breathing, hearing, and speech and language development. Children born with orofacial clefts might need other types of treatments and services, such as special dental or orthodontic care or speech therapy. After all tat research work on cleft, There are certain things to be taken care of during pregnancy.No wonder why our grannies say to take proper care of us during pregnancy. 📍Cleft occurs in pregnant women who smoke cigarettes, drink alcohol or take certain medications. 📍Having diabetes.There is some evidence that women diagnosed with diabetes before pregnancy may have an increased risk of having a baby with a cleft lip. 📍Being obese during pregnancy. There is some evidence that babies born to obese women may have increased risk of cleft lip and palate. I remember d time Wen I was pregnant how my mums(Mom n MIL) put a lot of emphasis on folic acid supplements, i hated taking medicines during pregnancy but they wre so keen tat tey used to enquire my husband did i take tat particular tablet or not.. YES, FOLIC ACID IS THAT IMPORTANT!! During d initial stages of pregnancy it’s important to note that all the birth defects happen during the first 28 days of the pregnancy, which is crucial, because this is the time when the woman mostly does not even know that she’s pregnant! This is the reason why most women who are of child-bearing age should make sure to consume enough folic acid, especially if a pregnancy is being planned. Folic acid works to form healthy red blood cells, which are imperative for good health. A lack of folic acid in the body can lead to Folate-deficiency n causes birth defects in the baby. Folic acid reduces the risk of anemia, spine disorders, pre-mature growth ,poor growth in womb n even cleft palate. Proper intake of folic acid supplement provides a healthy body to d mother n her baby in the womb. 📝Take prenatal vitamins like Folic acid, which is actually really important during pregnancy. 📝Don’t use tobacco or alcohol. Use of alcohol or tobacco during pregnancy increases the risk of having a baby with a birth defect. 📝Avoid Smoking―Women who smoke during pregnancy are more likely to have a baby with an orofacial cleft than women who do not smoke. Understanding the factors that are more common among babies with a birth defect will help us learn more about the causes n one such work of http://anamayaindopacific.org/ and their FB page – https://www.facebook.com/Anamayaindopacific/ is so commendable whose vision is to create a CLEFT FREE INDIA. I was so elated to receive the invite n was equally excited to attend it..💗 The representative from @momspresso @prernawahi gave all d necessary information required for d event..